Android (s goog) and iOS (s aapl) phones may be gaining traction around the world, but after three years of development, Alibaba thinks there’s room in China for another smartphone platform. 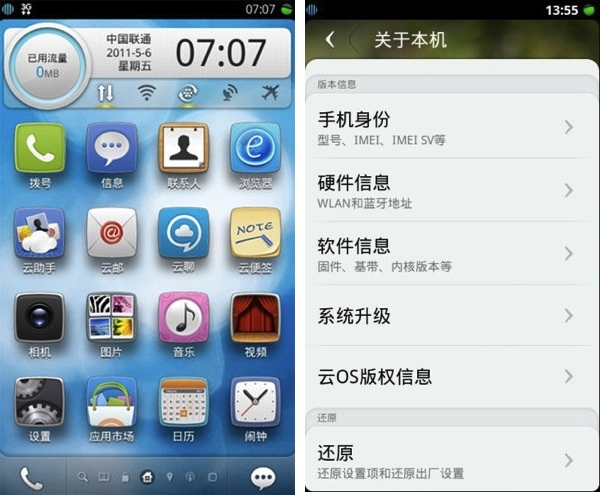 The company is launching its mobile platform, Aliyun, on the K-Touch W700 handset later this month. The Aliyun platform focuses on cloud-based, web applications but is also “fully compatible” with Google Android apps, according to a statement the company provided to the Wall Street Journal (s nws). Alibaba will complement each handset with 100 GB of data storage on its AliCloud service. In any other region of the world, I’d say such a device has no chance. But China’s mobile broadband infrastructure is still developing across the vast region and relatively few are using 3G-capable smartphones. Essentially, the country is ripe for smartphone growth and it shows. In the first four months of this year, the number of 3G subscribers jumped 44 percent to 67.57 million. That means in a population of more than 1.4 billion people, only a small percentage of the 900 million mobile subscribers are using smartphones. Contrast that with the U.S., where more than half of all handsets now sold are smartphones. The cloud OS will feature cloud services including e-mail, Internet search, weather updates and mapping & GPS navigation tools. A distinguishing feature of the cloud OS is its support for web-based apps. These offer users an Internet-like experience and do not require the user to download or install application software on their mobile devices. Cloud OS users can seamlessly synchronize, store and back-up data such as contact information, call logs, text messages, notes and photos to AliCloud’s remote data center, and can also access and update this data across all their PC and mobile devices. I’m not sure that “support for web-based apps” is a distinguishing feature, as all current platforms have the same support. Screen shots show the user interface to be similar to iOS, but with a hint of webOS (s hpq), so there’s nothing innovative in that respect, either. Then again, when less than 10 percent of all cellular subscribers are using a 3G handset, maybe innovation isn’t required. But I wonder how dependent upon the cloud Alibaba’s platform actually is.If the 3G infrastructure is still a work-in-progress for many areas across the large Chinese land mass, it could pose a problem for the handset. We’ll be talking more about the intersection of the cloud and mobile technology at Mobilize, September 26-27. Curiously enough, the latest build of Google chrome OS has Cloud-based elements in it as well. Looks like Alibaba’s 3 years of research is paying off, as even Google may be planning to debut a Cloud-Based Google Chrome OS for Tablets!!!! And possibly smartphones? Apple might choose to go the cloud route to, to make their Apple iPhone cheaper for the mid-level “feature” phone crowd that is not a part of the 50% of mobile users sporting a smartphone!! So will the combined effect of Android and Aliyun will threaten ios? Looks like it is derived from Android. I actually like their home screen better. It shows large icon and small text v.s. Android’s small icon and with long text under. Interesting.. A government controlled OS. Now they can monitor and make money at the same time. How did they make it 100% compatible with Android? If they have forked out Android codebase then good luck to them with handling fragmentation.. Or maybe who cares about customer satisfaction..
Thats because its a fork of Android. Which uses no Google services and Google sees no revenue but subsidizes the cost of the OS. Yet magically Google counts these phones in their activation numbers. Along with OS upgrades and whatever else they can think of. But you will never hear that from BGR right Kevin? I can’t believe I am replying to this troll, but Google has said a number of times now that activation numbers are a count of new devices activated with Google’s servers. If the device isn’t shipping with Google’s services (especially Market), then it doesn’t count as an Android activation. How would Google even know about the device to be able to count it if it doesn’t have any of Google’s code on it? Wow, this could be huge, and if they make a good native taobao app that runs well, alot of people will jump on it. The other phone from China I am looking forward to is Xiaomi MIUI Phone. Great specs, great OS, killer design team. What exactly makes a mobile phone cloud-based ? Mobile phones connect to servers via wireless transport ( be it CDMA,GSM,Wifi) etc. What is a cloud phone as opposed to non-cloud phone. Aren’t all mobile smart phones cloud-capable ? I prefer the term “cloud-dependent”, meaning they provide zero value without a network connection. I wonder if anybody writing mobile articles today remembers “SavaJe”? Hmmm wonder who picked up the IP to that company? I assume this phone is based on stolen patents and stolen technology. Only the Chinese are the stupidest people on earth who can’t seem to invent their own products. You’re about to experience a big surprise. Since when are 12-year-olds allowed on here? Android is too free and laissez faire. Expect some banning action after this thing gets traction. What happens to iOS – I dont know. But Apple already censors, I mean approves “wholesome” apps already so they may be good. Excellent for crowd control. Wouldn’t be surprised if they tried to coerce OEMs who want to operate in Chine into preinstalling this.